Employment has the power to change lives. Didlake has helped thousands of people achieve employment success. Through jobs at our contract sites and administrative offices and through our Supported Employment Services in the community, people with disabilities are able to achieve and maintain employment that opens the door to additional opportunities. As a part of America’s workforce, people with disabilities represent a largely untapped and often unrecognized talent pool. Each October, the United States Department of Labor recognizes and celebrates the contributions of workers with disabilities and strives to educate about the value of a workforce inclusive of their skills and talents. 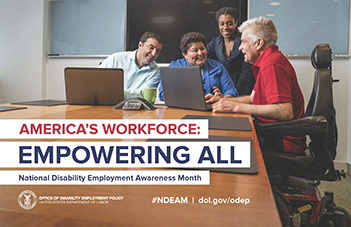 The National Disability Employment Awareness Month (NDEAM) theme this year, America’s Workforce: Empowering All, strengthens the commitment to a robust and competitive workforce. Increasing the employment rate of people with disabilities benefits America’s workforce as well as our economy and individual lives. While unemployment rates for people with disabilities are at a historic low, the percentage that participates in the workforce stands at only 20.1%. Which means that over 10 million Americans with a disability, ages 16-64 are not a part of the labor force. With proper supports, including vocational rehabilitation, millions of people can become active participants in America’s workforce. A growing number of employers are recognizing and experiencing the positive outcomes of hiring people with disabilities — increased retention, improved productivity and morale as well as committed and highly engaged employees. At Didlake we experience the many benefits associated with an inclusive work environment every day. As a long time employer of people with disabilities, we know that all individuals have a contribution to make and that our differences create a vibrant culture that reflects the world around us. Learn what you can do to create and strengthen inclusive work environments.